My two favorite desserts are “anything with chocolate” and “anything with pumpkin.” This recipe includes both – although with its relatively low sugar content, you don’t have to save it for dessert. This muffin does not have the cake-level of sweetness that you’ll usually fine in prepackaged muffins or the ones they sell at coffee shops. I use just enough sweetener to balance the pumpkin flavor. 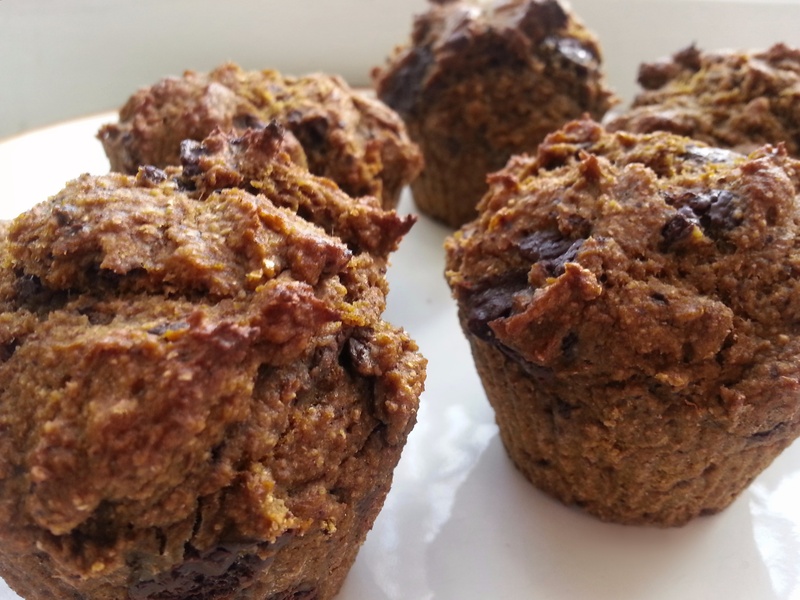 If you want a more cake-like muffin, you can double the sugar and replace half the whole-wheat flour with white flour, and you’ll still have a healthier pumpkin muffin recipe than most. The recipe is fairly low in fat, but you can cut the fat even further (and make the muffins vegan) by using baking powder and a little water in place of eggs, as indicated in the recipe. You can also replace the oil with an equal measure of applesauce or pumpkin purée, and the chocolate chips with raisins. Mix wet ingredients (pumpkin, applesauce, oil, and eggs or water/baking powder mixture) together.